Leaks in duct systems are now renowned as a major source of energy waste in both new and existing houses. Duct leakage can account for as much as 25% of total house energy loss. Leakage can also prevent heating and cooling systems from doing their job properly, resulting in too hot or too cold rooms, and humidity issues. Additionally, duct leaks can create indoor air quality problems by pulling pollutants and irritants directly into the house. Leaks in the supply duct-work cause conditioned air to be discarded into the attic, crawlspace or garage instead of into the house. Return leaks draw outside air (hot in summer, cold in winter) into the duct system decreasing efficiency and capacity of the HVAC system. In humid climates, moist air being pulled into return leaks can overpower the dehumidification capability of the air conditioning unit. Many homeowners complain of a “clammy” environment even when the air conditioner is running. Duct leaks can cause the air coming from heat pumps to feel luke-warm or even cold during the winter. Leaky duct work has also been found to significantly increase the use of electric strip heaters in heat pumps during the heating season. Leaks in return ductwork draw air into the house from crawlspaces, garages and attics bringing with it dust, growth spores, insulation fibers and other contaminants. 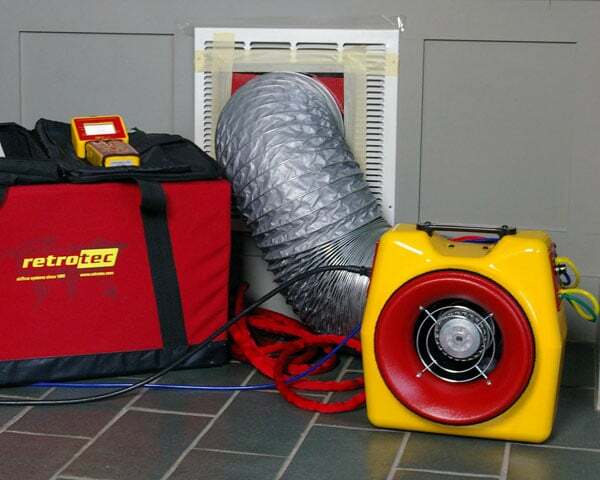 Bertie Heating & Air Conditioning LLC, duct leakage performance tests can be scheduled using the Duct Blaster technique. The test involves pressurizing the duct system with a calibrated fan and simultaneously measuring the air flow through the fan and its effect on the pressure within the duct system. Testing procedures can be set up to measure only duct leaks which are connected to the outside, or to measure total duct leakage. Duct leakage measurements are used to diagnose and reveal leakage problems, estimate efficiency losses, and certify the quality of duct system. The Duct Blaster fan is first connected to the duct system at the air handler cabinet, or a return grille. After temporarily sealing all remaining vents and grills, the Duct Blaster fan is turned on to force air through all holes and cracks in the duct work. The fan speed is then amplified until standard pressure is achieved in the duct system. A precise leakage measurement is made and estimates of efficiency losses from duct leakage are added up.